2 The Catalyst "VIKING" FROM PAGE 1 Viking, the secretaries became sympa thetic and called Schenck. According to Martin, the Dean was reluctant to guaran tee air conditioned accommodations for students until Nemeth and Martin threat ened to call the press the Department of Health and Rehabilitative Services (HRS ) and the Occupational Safety and Health Administration (OSHA). Johnson quoted the cost of these hotel rooms: 15 rooms for 5 nights, at $32 per room per night-about $2400 And in recompense, Johnson said that he's committed to offering the Viking residents a yet-undetermined rebate which could total more than $3000. Shannon Hamlett Viking R A., re marked that moving the students to the hotel was not an easy task: all the rooms were double occupancy, and most of the Viking residents don't wish to have room mates. One of the more vocal Viking resi dents was Kelly Samek. Regarding the failure of the A/C, Samek said, "At first it sucked ... I'm a thesis student and I got nothing done. She later added, "I slept for most of the day ... I just couldn't do anything else here [in Viking]." According to Samek, the Viking build ings were not designed to be habitable without air conditioning; the architecture does not promote natural ventilation She noted that the relocation to the hotel wa a "massive improvement," but that it was General Editor Heather Oliver Managing Editor Charles Choi Features Editor Aaron Gustafson Staff Writers Hugh Brown, Paul Chretien. Rachael Herrup-Morse Jake Reimer Rocky Swift Layout Online Developer Cyndy Ekle Nicole Ganzekaufer Business Managers Rachael Morris, Alicia Marini Contributors Heather Lazar, Mollie Lee, NCSA Anne Tazewell, NC Faculty News not a satisfactory long-term so lution Alena Scandura, Coordinator of Student Activities is also a resident in Viking. The doors to her apartment face north-south so practically no breeze could run through the home. "When we' d walk into the apartment It usually was an oven ... The cats would Jay there and pant .' remarked Scandura. "When we'd walk into the apartment, it usually was an oven ... -Alena Scandura Scandura was not offered accommoda tions in the hotel, and was dismayed that she had not being given frequent updates on the status of the A/C repairs. The air conditioning system is old According to Richard Onley Coordinator of the Physical Plant. the system was in stalled by Trane Co in 1959. Since such a system is not expected to last beyond 20 years, Viking's air conditioning system was liable to fail, and was not easy to re pair When Onley found out that the motor had burned out on Labor Day he discovered that the motor drive system was also damaged. No replacement parts were available for the motor drive, which had to be re placed The motor itself could not simply be replaced because a comparable motor that' l1 fit onto the old motor mounts is not September 23, 1997 avail able anymore. The motor had to be either rewound or completely rebuilt. However, when the motor became opera tional again the workers noticed that the compressor was seizing which may have caused the motor to burn out in the first place. Many students wondered why the string of repairs took so long. The reasons are many. Repair work involved multiple components of the system which in volved several outside contractors The repair of the motor was also delayed by the fact that it broke on a holiday, and that no repair shops were available to rewind the motor until three days later "They made it as fast as they could," noted Onley. The new motor drive needed to be shipped from Texas, which took a whole day The problems with the compressor were not discovered until the motor was running. The overhaul of the compressor took several days with out-of-town tech nicians Then an oil pressure protection switch, which prevented the compressor from running without enough lubrication, failed. The air conditioner had to be shut down to avoid damaging the compressor The replacement of the oil pressure switch took a couple more days, pushing the reactivation of the air conditioning system to September 15. Why not replace the whole system? Replacing the old air conditioning equip ment would be expensive. Not only does The Catalyst is available on the World Wide Web at llttp://www.sar.usfedul-catalystl Direct submissions and inquiries to: The Catalyst 5700 Tamiami Tr. Box #75 Sarasota, FL 34243 c atalyst@vinu sar.usfedu Submissions may also be placed in the Catalyst box marked "Letters to the Editor/Contribu tions (in the student government boxes next to Barbara Berggren s office) Letters to the Editor should be no more than 250 words. Contributions may range in length from 250 to 500 words. Submissions should be labeled as either letters to the editor or contributions and include names and contact information. Online submissions should indicate in the subject line if they are letters to the editor or contributions No anonymous submissions will be accepted. Submissions should be received by 5:00p.m. Fnday m order to appear in the following week's issue The Catalyst reserves the right to edit submissions for reasons of space, grammar or style. The Catalyst is an academic tutorial sponsored by Maria Vesperi. 4 The Catalyst Entertainment September 23 1997 BALLET FESTIVAL PUTS CULTURE IN PATHETIC LIVES by Rocky Swift Wh e n I a ttended the Ballet F es tival and Choreography Workshop at the Asolo theatre last Friday I h a d to adjust to the fact that the athletic men in tights that I was watching weren t ever going to bust each other open with metal chairs. Such are your expectations if you grow up in Georg i a watching pro wrestling. Oh don t act surprised, all of you expected a rasslin' lead, Har har har Rocky at the ballet!" Yeah, well it was pretty fun, okay? This ballet festival kicked off the Sarasota Ballet's season It runs from November through April and fea tures shows such as "Cinderella Don Quixote;' and Eva Peron-A Dance Portrait.' The festival featured Sarasota s Ballet troupe as well as visiting choreogra phers and dance companies. The show I attended began with a piece titled Variation on a Theme," performed by Dance Alive!, a company based out of Gainesville It was pretty terrible by anyone s standards The set had bad paintings of lilies hanging above the stage that seemed fitting for the fluffy, insubstantial dance that followed One of the dancers was disturbingly anorexic. The accompany ing music by Brahms seemed to be ignored by the dancers, in a performance that strongly reinforced the preconception I had : that ballet was boring and stupid The next dance was a duet called "Taming of the Shrew" and was inspired by Shakespeare s play of the same name The program described it as "a funfilled and unabashedly comical romp about the timeless battle between the sexes." The action, to put it into words, went something like this : Petruchio: "Give me some wine, woman! Katharina: Hah, I drink the wine myself!" Petruchio : "Wench !" Together: '' Now lets dance1 I've been in volved in many sexual battles but none of them ended in dancing. Anyway he ends up forcing her to kiss him, picks her up. spanks her and they exit, s tage right together in pure bliss. Makes that whole feminism nonsense seem pretty silly, doesn't it? Thankfully the intermission arrived, and I had a pretty grim feeling about the second half of the show Fortunately, the performances from then on were much more entertain ing. The next dance was titled "A Love Supreme" (choreographed by Demetrius Klein and performed by the Sarasota Ballet Company). These dancers looked very young but were all quite talented. The performance was a sort of angst ridden beatnik ballet set to some soulful John Coltrane jazz. The costume colors were a curious combination of black and fifties pastels, which seemed a bit hokey, but certainly excusable The choreography was clearly inspired by the improvisational jazz score, and the dancers suc ceeded in emoting the rhythm of the music. The final piece was an interpretation of Stravinsky s Rite of Spring." This dance was also performed by Dance Alive!, but this one was far better than their first piece. The dance followed a chaotic, frenzied theme, in keeping with the powerful score. The female lead was exceptional. Not many of the aged crowd lasted until the last dance, but I was glad I did The last two performances certainly made the show for me. I doubt I'll be at the ballet every week but if you re interested, student rush bargains at the Asolo can help put some culture into your depraved, pathetic lives uTURNER" FROM PAGE 1 completely unfazed by this donation Whether philanthropy comes easily to Turner or not, he has put the pressure on other leading business men to pay up. United Nations by the United States. Also forbidden is the use of the donation for bureaucracy maintenance of the United Nations either in Geneva or in the New York section uSCUBA" FROM PAGE 1 of her friends. The Organismic Lab, where the box was delivered. is usually open until 9:30 p.m., and no signs of forced entry were noticed, but as Karylowski states: "Most Nat Sci students have the access code to the building [Hanson] The box was most likely taken sometime between 4:15 and 9 : 30 p.m on Wednesday, but it is possible that someone with access to both the building and the lab could have taken it at anytime before 9 : 30 the following morning, when Beulig first noticed that the box was missing. Bill Gates and Phil Knight, be ware. Of the unwillingness to match such magnanimous phil anthropy, National Public Radio reports that Turner said it's a pretty pathetic thing." According to Turner the money he has set aside for the United Nations will be doled out over a ten year period. Each year he will be sending one hundred million dollars, and this will continue for ten years. There are, however, some restrictions. The money given by Turner is not to be used to pay of the dues owed to the Rather, the money is to be used for specific charities set up and run by the United Nations. Environmental aid, in the areas of both education and pro tection, is to be increased. Also to be funded are various programs aimed at increasing the quality of land mine reduction, childrens' health world-wide, and educa tion. As yet, there has not been much reaction in the business world tu Turner s procla mation. although it is certain that attention will be paid by the pub l ic to the reaction of Turner s contemporaries in the business and finance sectors. $1,000,000,000,000 Officer Jim Marion of the University Police Department is investigating the di appearance of the box. but could not be reached for comment. Beaver, how ever, stated : ''I'm only interested in recovering the gear; anybody who hap pens to find it can simply bring it to me, no questions asked." 6 The Catalyst Campus Life September 23, 1997 STUDENTS RESPOND TO RECONSTRUCTION A LETTER FROM THE NCSA Dear President Castor: On behalf of the student body, we would like to thank you and Provost Tighe for corning to speak to us last month eedless to say, your announcement about the restructuring of the deanship initiated a Hurry of conversation within the New College community. Discussion among the students culminated m a town meeting on the issue a week later with record atten dance. Interim Dean Langston stayed throughout the entire three-hour session to answer student concerns and to clarify a number of controversial issues. lt is now clear that the creation of a single chief executive officer will facilitate the administra tion of both New College and the University Program. However, the successful implementation of this new structure demands continued cooperation and open communication between the New College community and the university administration. To that end, we request that in the future our New College Student Alliance President(s) are kept informed of all proposals and de cisions affecting the New College community as outlined in the NCSA constitution Student Bill of Rights, article 1.2b b) Students shall be free, individually and collectively, to express their views on issues of College and University policy, and have the right and responsibility to participate in all policy changes that affect them, through the mechanisms outlined in this docu ment. College and University administrators have the responsibility of informing the Alliance (through the President) of any proposed change in policy that directly affects students, and must involve Academic and Council of Student Affairs mem bers in the formulation of these policy changes before they can he implemented. To begin a d1aiogue on the issue, we offer our suggestions re garding the dcfinlllon and selection of the new position. The following seven Hems were agreed upon by the Town Meeting as necessary aspects of the new structure. l. Change the name of the dean to either "New College Dean and Warden and USF Sarasota Campus Chief Administrator" or "Warden of New College and Dean of the USF Sarasota-Manatee Campus". Although seemingly a minor point, this title will emphasize to the campus community and potential applicants the important distinctions between the two programs. More importantly, it in dicates the greater responsibilities associated with administrating a unique residential campus. Finally, "Warden" reinforces New College s historical ties to New College of Oxford. 2. Keep the Offices of Student Affairs for the two programs separated. While the consolidation of the deanship may result in certain administrative efficiencies, a similar consolidation of Student Affairs is unadvisable given the radically different character of student life for New College and the University Program. It is generally agreed that the former consolidation of UP and New College Student Affairs proved to be a failure, while the success of the current structure has been clearly illustrated both by the experience of the New College community and the positive re port of last year's self-study committee. 3. Give the joint dean local control of the campus police. Efforts to maintain a positive relationship between the poPROFESSORS RESPOND TO RECONSTRUCTION A LETTER FROM TH E FAC ULT Y Motion Concerning the Sarasota Campus Deanship Revised after discussion in the Social Sciences Division, September 3, 1997 Unanimously adopted by New College Faculty, September 10, 1997 Moved that the following resolution be adopted and sent to all interested parties: Feeling that we have a large personal and institutional stake in the future of New College, we, the New College faculty, would like to express some reactions to the proposed changes in the administrative structure of the Sarasota Campus. Depending on the commitment of President Castor and Provost Tighe to maintain and strengthen New College as a unique undergraduate honors college within the University of South Florida, we hope that the administrative changes will bring increased resources to Sarasota, more students, more fac ulty lines and better facilities, but we are also concerned that the institutional identity of New College, and thus its ability to re cruit on a national level, not be weakened. We assume that there will be a national search for the new Sarasota dean, and suggest the following stipulations and characterizations of New College be incorporated into the job description. We believe that such a description will aid in securing the best possible candidates for the position. That the new chief administrator in Sarasota be called the New College Dean and Warden and Sarasota campus Chief Administrator, or perhaps the New College Warden and Dean of the USF Sarasota Campus. That he or she be tenured in the New College faculty. That he or she be an ex officio member of the New College Foundation executive committee. That the New College mandate for an independent national student recruiting strategy be reaffirmed and adequate funding for staff and financial aid for students be assured. That the long standing New College faculty goal of expan sion to 800 students/80 faculty with added appropriate support, preserving the historic practice of a I 0-1 student-faculty ratio, be reaffirmed and acknowledged as part of the state university mas ter plan. That New College is assured of continuing as a residential liberal arts college in Sarasota. That New College's traditional practice of faculty gover nance in all matters of academic policy and personnel, within the framework of state law, is acknowledged and reaffirmed. The Catalyst Campus Life September 23, 1997 7 lice and the student body have been frustrated by the fact that the police are not directly accountable to the community, but rather report through a chain of command that circumvents a di alogue with local administrators. Local accountability to the joint dean will at the very least provide an avenue for appeal when conflicts occur and may alleviate perceptions of the police as insensitive to or disconnected from the needs of the commu nity. Additionally, we have a well-developed student judicial sys tem and a strong desire to handle non-felony violations internally as outlined in the NCSA constitution in Section 1.2-h. h) Students shall not be subject to non-academic disciplinary ac tions without the chance to first uulize the due process offered by the New College Student Alliance Judicial Branch. which will be considered the first body of appeal in all alleged infrac tions of the Student Code, Student Rights, non-academic College or University regulations, or non-felony violations of local state, and federal law Although these procedures have been ratified by both Dean Michalson and Dean Schenck, it has been difficult to implement them because neither had clear jurisdiction over the actions of the campus police. 4. Give the joint dean direct control of financial aid. Because of conflicts that have arisen in the past between the flexibility inherent in New College's academic structure and the standardization required for scholarship criteria, it seems impor tant that records and registration and the office of financial aid be accountable to the new dean, as he or she would be familiar with both structures. Giving the joint dean some degree of con trol over financial aid would create a line of appeal should similar conflicts arise in the future, and possibly allow the office of financial aid greater flexibility with scholarships in difficult cases. 5. Preserve the national recruiting mission of New College. New College's reputation for academic excellence is depen dent on its ability to recruit attractive students nationally and internationally. We cannot compete with other schools of similar caliber if we are unable to offer comparable aid packages. To reaffirm the national recruiting mission of the school. we ask that adequate funding for student scholarships and admissions staff be allocated as part of the restructuring process. 6. Reaffirm the mandate for a 10:1 faculty to student ratio. New College's contmued success and academic excellence is a direct result of the opportunity for intensive personal interac tion between professors and students. Our unique contract and tutorial system requires that professors have the time to work in dividually with students. Thi i not possible without a low faculty-student ratio, adequate resources, and support staff. 7. Preserve the historical character of New College as a unique educational experience. ew College's origin as an independent institution based on a revolutionary approach to education is still reflected in the atti tudes and experience of the students today and serves to define New College within the University system. It is critical that the new dean promote the kind of balance between academic excel lence and academic innovation upon which the college was founded. and just as important that he or she promote a commu nity environment that fosters freedom, creativity and experimentation. It is our greatest concern that the spirit of this institution be allowed to grow and prosper, regardless of leader ship changes. We appreciate your consideration of these points, and hope that you will honor sections 1.2c and 8.7d of the NCSA constitu tion as follows. c) Formal recommendations made in writing to College or University administrators by the student Alliance bodies shall re ceive detailed and specific responses in writing from these administrators within ten working days. In cases where recom mendations by the Student Alliance are not adopted. the appropriate administrative authority will give detailed reasons for its response and indicate the lines of appeal for further con sideration. d) Our Mission: "That the natural state of the human spirit is ec static wonder! That we should not settle for less!!" Sincerely, The New College Student Alliance ----------------------------------------------------------------------------------------------------------------------------------SAC MINUTES 9/11/97 Present: Jake Reimer Rocky (proxy for Hazen), Vijay Sivaraman, Mario Rodriguez Kelly Singer, Judd Wilson, and Dave (proxy for Alisdair) l) Tom Barnard requests $23.10 for copies. Allocated: $23.10 2) Ttina Sarglask.i requests $150 in matching funds for second court lounge clean-up party. Allocated: $150 3) Trina Sargalski requests $49.50 for 100 copies (x 18 ides) of a Women's Health Zine. Allocated: $49.50 (Judd abstains) 4) Noah Teitelbaum requests $26.00 reimbursement for copies. Allocated: $26.00 (Never again, Noah, NEVER AGAIN, NOOOooooo) 5) Noah Teitelbaum requests $12.15 for additional copies for theatre scripts. Allocated: $12.15 6) Noah Teitelbaum requests $19.00 for PCP mailings. Allocated : $19.00 7) Noah Teitelbaum (free monkey-moonwalker with every tenth allocation request ) request 33,000,150 for sunset fruit festival and virtual reality trampoline. Allocated: $100 for three meetings of the sunset fruit club. Suggestion: Buy a kaliedoscope. 8) Hazen will receive 1/3 ($50) of the SAC chair stipend, and Kelly Singer (new chair) will receive 2/3 ($100). 9) Official motto of this semester's SAC: "It just isn't the same without Hazen." All votes unanimous unless otherwise indicated. 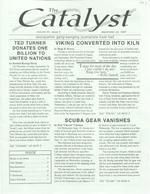 8 The Catalyst Community September 23, 1997 ORIMULSION-FUEL OF THE FUTURE OR POISON? by Jessica Katzenstein sulfur emissions from orimulsion can cause acid rain and smog, Bitor America, a subsidiary of Petroleos de Venezuela, S.A. aggravate heart and lung diseases and destroy plant life such as (PDVSA, the world s second largest oil company), and Florida sea grass and citrus. And as far as the nitrogen oxide emissions Power and Light (FPL) are making plans to convert the Parrish are concerned, the use of orimulsion at the Parrish plant will power plant in Manatee country to run on a new sulfurous fossil emit an extra 10,000 tons over the Manatee area fuel process called orimulsion Much debate has erupted over The extra nitrogen emission is caused by the plant s expanthis controversial new fuel, and many environmentalists fear that sion from 30% usage to 87 % usage It s true ; orimulsion releases the switch may be inevitable. less nitrogen But in order to cover the cost of switching over So what is orimulsion? According to Bitor America the to this process the plant would have to bum at a higher rate company responsible for creating testing and researching this r:;a than usual. The plant's extra running time will create new jobs new fuel process, orimulsion is a product composed of 30% and up to $42 dollars in savings for FPL customers, (per water and 70% natural bitumen, which is both readily available month? per year?) but at the cost of extra nitrogen and sulfur and relatively inexpensive to produce Over 1.2 trillion barrels of emJssJons. bitumen exist in the Orinoco Belt in Venezuela, a volume Another drawback of orimulsion is its byproducts. The South greater than 50% of the volume of the world s estimated Florida Environmental Reader estimates that 710,000 tons oil reserves. The existence and possible capabilities of gypsum and 20,000 tons of fly ash will be gener-of this bitumen field have been known of for 50 ated per year. The corporation claims that these years, but the technology and environmental precaubyproducts can be recycled into marketable products tions necessary to extract it have only been discovered such as wallboard and concrete aggregate The environrecently mentalists claim that no such recycling plans have been made, Bitor America insists that the drilling process used to obtain and that all the gypsum and ash will fill up and destroy more the bitumen causes little or no damage to the environment, as wetlands. opposed to other techniques (such as strip mining), which are Orimulsion plants have already been installed in the U.K., very destructive in extracting similar fossil fuels The corporaCanada, Japan and Denmark with a lot of economic success. The tion also affirms that they are planting half a million acres of plans to convert the Parrish plant have been in consideration pine trees in order to refurbish the ecosystem and further ensince 1993, and FPL has overcome several obstacles to bring hance the vitality of the Orinoco region. this project into being. The concerns voiced by environmenBitor America claims that orimulsion is a comparatively r:;a talists and residents of the Manatee area have been heard and cleaner alternative to fossil fuels when used with state-of-theattended to, but the proJeCt is still in the works The question art pollution control systems According to the corporation these that remains is whether these residents concerns are valid or scrubbers" will allow orimulsion to burn with lower sulfur merely of a ot In My Backyard" nature. There is no perfect dioxide and nitrogen oxide emissions per kilowatt-hour than oil fuel, and the benefits of a cheap, cleanly extracted fossil fuel or coal. might perhaps outweigh the possible environmental setbacks. This claim has been refuted by a number of sources. includOr perhaps not. ing the South Florida Environmental Reader, which say that the FOUR WINDS COFFEE HOUSE Contributed by Heather Lazar and Mollie Lee What's missing from your life? Has it been a while since you've felt that special thrill, that unique taste? No, not that. How about the comfort of a good cup of Java? While it's still a work in progress, we 're working hard to get the campus coffeehouse up and running If you have heard about this lovely concept, believe in it, for it is the Mecca of your caffeine journey If you haven't heard about it. here are the basics : In January we will open an entirely student-run coffeehouse ( in the renovated barn on Don Drive (that road to l College Hall). While our primary goal will be serv' ing excellent coffee products the Four Winds Cafe will also feature food and fun. There will be a small stage 't-G for bands and performers, a screen for showing i l films, and a conference room for meetings. We _. hope to see the Cafe become a place where ew College students can interact with each other. faculty, UP stu dents alumni, and members of the Sarasota community. The current student managers for the Cafe arc Beth Faichney Kin Ping Koo, Heather Lazar, and Mollie Lee We are working closely with a host of New College faculty and staff members, as well as Darilyn Avery. the alumna who ha been the driving force behind this project. We are all very excited about the Cafe. but it isn't something that we can ( or want to) do alone If the Four Winds Cafe is something that interests you please come to our informational meeting on Thursday We will give you an in-depth update on what s going on w ith the Cafe right now AI o we 'll hand out applications for employee positions and discuss what the hiring proces will be like If you can t make the meeting but would like an applicati o n or more infor mation. talk to one of the managers or leave a n ote in the cafe box, #2. We hope to see you Thursday! 10 The Catalyst Looking for a good time? C tudent Aaron Gustafson (a.k.a. DJ Dobbs) spins all the best 80s music every other Monday, so drop by Lift, on the outh end of Main Street in Sarasota. and wear your dancing shoes. If you would like to join the New College Environmental Studies Email List, drop a line to samek@virtu. This list is for the promulgation of environmental information. be it on-campus, local, re gional, national. or international. Environmental Studies majors and envi ronmental activists arc urged to join. The Debacle, New College's alterna tive student newspaper, is seeking contributions and staff members. Any Announcements and all are invited to submit essays, car toons, opinions, questions, ect., to box 526. Jf you would like to sign your soul over. we are currently looking for an as sistant editor, a layout assisrant, a photographer/graphic artist, and writers. More information can be obtained from signs posted around Ham Center or by emailing mshannon@virtu. If you have any environmentally re lated art. research papers, or essays which you would like to see published and distributed to your fellow students, please submit them to Kelly at box 526. Come on. if you've taken any environ mental studies courses, you're bound to have something floating around. Submit! CAREER CENTER Wed. Sept. 24 oon USF Overseas Programs Presentation, Julie Hale, Fishbowl Wed. Sept. 24 4:00 p.m. Writing Graduate School Application Essays, PME-219 Presented by Jan Wheeler. Writing Specialist for NC Sat. Sept. 27 9 a.m. I p.m. Free Test Drive-Practice GRE, LSAT, GMAT and MCAT tests will be offered free by Kaplan. Sign up in the Career Resource Center Mon. Sept 29 Noon USF International Student Exchange Info. Session, Fishbowl Pineapple Press has a part-time Editorial Assistant position. The Longboat Observer has full-time reporter positions available. Alaskan Observers, Inc. has full-time positions available year-round for Domestic Fisheries Ob erver. 1998-99 Orchestra Management Fellowship Program-An on-the-job program which provides management candidates with a broad. practical training in various areas of orchestra management and administration. Strong management skills. musi cal knowledge, leadership skills, proven organizational and communication skills. Oxford and the Rhodes Scholarships: 32 Scholars are selected each year from among those nominated by each of the fifty states. Proposed course of study must be available at Oxford, and the applicants undergraduate program must provide a suffi cient basis for further study in the proposed field. Rhodes Scholars are appointed for two years of study in the UniversJty of Oxford, with the possibility of renewal for a third year. All educational costs are paid on the Scholars' behalf by the Rhodes Tru tees. National Science Foundation (NSF) Graduate Research Fellowship Program 1998: The NSF will award approximately 1,000 new Graduate Research Fellowships to support graduate study leading to research-ba ed masters or doctoral degrees in sci ence, mathematics, and engineering. Each three-year fellowship provides a stipend of $15,000 for 12-month tenure, and a cost-of-education allowance of $9,500 per tenure year. Deadline: November 6. 1997. 1998 Spring Internship ProgramU.S. Senator Bob Graham: Senator Graham's Washington. D.C. spring internship program offers a unique opportunity for Florida students to experience their federal government and Congress in action. The program is designed to augment undergraduate studies and is not limited to students majoring in any specific discipline. Students must commit to working at least 30 hours per week. No stipend, only academic credit. Deadline to apply: ovember 10, 1997. For additional iriformation stop in the Career Resource Center, PME-119 September 23, 1997 The Catalyst is opening our Wednesday meeting this week to a selfimprovement focus group. Ideas for future articles and features and editorial policies will be discussed by all. 6 : 30, Ham Center couches. 'FINANCIAL AID Application forms for the faJI 1997 New College Alumnae/i Association Student Grants are available in the alumnae/i office and the Career Resource Center. Deadline for ubmitting com pleted proposals for both individual and group grants is 4 p.m., Friday, Oct. 24. Application requirements for students participating in group projects have changed thi year. Student applications for group projects or collaborations must be combined in portfolio format and sub mitted by the sponsoring faculty member. There are till a number of students who have not received scholar hip money from the Florida Bright Futures pro gram. Many students awarded chrough the program are aware that while they met the qualifications for the Florida Academic Scholarship (full tuition + $600 for books), their name appeared on our authorization list from the State on the Florida Merit Scholarship li t (75% of tuition). The Financial Aid Office is veri fying with the State the status of each New College tudent who was awarded the scholarship, but has yet to receive funds. We realize the wait is frustrating. The State has asked us to reassure you that you will receive the funds for the ap propriate scholarship you qualify for. The Financial Aid office will be sending indi vidual letters to each of you during the week of September 22 regarding your sta tus. Jf you have received an updated award lelter from the State, please pro vide our office with a copy. Thanks for your patience on this one. There are also ome students who have not received Florida Student As istant Grant funds. We are verifying the status of those award a well. Individual notices will also be sent to stu dents regarding their stacus for the award beginning September 22. If you have questions, please caU the Financial Aid Office, 359-4255.